The Beqaa Valley (Arabic: وادي البقاع‎, Wādī l-Biqā‘, Lebanese [bʔaːʕ]; Armenian: Բեքայի դաշտավայր), also transliterated as Bekaa, Biqâ and Becaa and known in Classical antiquity as Coele-Syria, is a fertile valley in eastern Lebanon. It is Lebanon's most important farming region. Industry also flourishes in Beqaa, especially that related to agriculture. The Beqaa is located about 30 km (19 mi) east of Beirut. The valley is situated between Mount Lebanon to the west and Anti-Lebanon mountains to the east. It forms the northeasternmost extension of the Great Rift Valley, which stretches from Syria to the Red Sea. Beqaa Valley is 120 kilometres (75 mi) long and 16 kilometres (9.9 mi) wide on average. It has a Mediterranean climate of wet, often snowy winters and dry, warm summers. The region receives limited rainfall, particularly in the north, because Mount Lebanon creates a rain shadow that blocks precipitation coming from the sea. The northern section has an average annual rainfall of 230 millimetres (9.1 in), compared to 610 millimetres (24 in) in the central valley. Two rivers originate in the valley: the Orontes (Asi), which flows north into Syria and Turkey, and the Litani, which flows south and then west to the Mediterranean Sea. From the 1st century BC, when the region was part of the Roman Empire, the Beqaa Valley served as a source of grain for the Roman provinces of the Levant. Today the valley makes up 40 percent of Lebanon's arable land. The northern end of the valley, with its scarce rainfall and less fertile soils, is used primarily as grazing land by pastoral nomads, mostly migrants from the Syrian Desert. Farther south, more fertile soils support crops of wheat, corn, cotton, and vegetables, with vineyards and orchards centered on Zahlé. The valley also produces hashish and cultivates opium poppies, which are exported as part of the illegal drug trade. Since 1957 the Litani hydroelectricity project—a series of canals and a dam located at Lake Qaraoun in the southern end of the valley—has improved irrigation to farms in Beqaa Valley. Zahlé is the largest city and the administrative capital of the Beqaa Governorate. It lies just north of the main Beirut–Damascus highway, which bisects the valley. The majority of Zahlé's residents are Lebanese Christian, the majority being Melkite Greek Catholic, Maronite Catholic, and Greek Orthodox Christians. The town of Anjar, situated in the eastern part of the valley, has a predominately Armenian Lebanese population and is also famous for its 8th-century Arab ruins. The majority of the inhabitants of the northern districts of Beqaa, Baalbek and Hermel, are Lebanese Shia, with the exception of the town of Deir el Ahmar, whose inhabitants are Christians. The Baalbeck and Hermel districts have a Christian and Sunni minority, mainly situated further north along the border with Syria. The western and southern districts of the valley also have a mixed population of Muslims, Christians and also Druze. The town of Joub Janine with a population of about 12,000, is situated midway in the valley, and its population is Sunni. 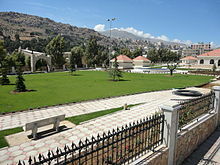 Joub Janine is the governmental center of the region known as Western Beqaa, with municipal services like the serail which is the main government building in the area, emergency medical services (Red Cross), a fire department, and a courthouse. Other towns in the Western Beqaa district are Machghara, Sabghine, Kamed al Lawz, Qab Elias, Sohmor, Yohmor. These towns are all a mix of different Lebanese religious confessions. Rachaiya al Wadi, east of the Western Beqaa district, is home to Lebanon's share of Mount Hermon and borders Syria also. The district's capital, also Rachaiya al Wadi (as not to confuse with Rachaiya al Foukhar in South Lebanon), is famous for its old renovated souk and what is known as the castle of independence, in which Lebanon's pre-independence leaders were held by French troops before being released in 1943. The southern section of the district is inhabited with Druze and Christian Lebanese, while the other northern section is mainly inhabited by Sunni Lebanese. Due to wars and the unstable economic and political conditions Lebanon faced in the past, with difficulties some farmers still face today, many previous inhabitants of the valley left for coastal cities in Lebanon or emigrated from the country altogether, with the majority residing in the Americas or Australia. The ancient Roman ruins of Baalbek, an ancient city named for the Canaanite god Baal. The Romans renamed Baalbek "Heliopolis" and built an impressive temple complex, including temples to Bacchus, Jupiter, Venus, and the Sun. Today, the ruins are the site of the Baalbeck International Festival, which attracts artists and performance groups from around the world. Our Lady of Bekaa, a Marian shrine located in Zahlé, with panoramic views of the valley. Drugs have a long tradition in the Beqaa Valley, from the days of the Roman Empire until today cultivators and tribal drug lords working with militias built up a thriving cannabis trade. During the Lebanese Civil War, cannabis cultivation was a major source of income in the Beqaa valley, where most of the country's hashish and opium was produced, a multibillion-dollar industry fueling the agricultural sector as well as political factions and organized crime. The trade collapsed during the worldwide crackdown on narcotics led by the United States in the early 1990s. Under pressure from the U.S. State Department, the occupying Syrian Army plowed up the Beqaa's cannabis fields and sprayed them with poison. Since the mid-1990s, the culture and production of drugs in the Beqaa valley has been in steady decline, by 2002 an estimated 2,500 hectares of cannabis were limited to the extreme north of the valley, where government presence remains minimal. Every year since 2001 the Lebanese army plows cannabis fields in an effort to destroy the crops before harvest, it is estimated that this action eliminates no more than 30% of overall crops. Although important during the civil war, opium cultivation has become marginal, dropping from an estimated 30 metric tonnes per year in 1983 to negligible amounts in 2004. Due to increasing political unrest that weakened the central Lebanese government during 2006 Lebanon War and 2007 (Opposition boycott of the government) and due to the lack of viable alternatives (U.N. promises of irrigation projects and alternative crop subsidies that never materialised) drug cultivation and production have significantly increased, but remain a fraction of civil war era production and limited north of the town of Baalbek, where the rule of tribal law protecting armed families is still strong. ^ "Chateau Musar". Chateau Musar. Retrieved 10 September 2013. ^ "Lebanese wine". Domaine Wardy. Retrieved 10 September 2013. ^ "Lebanese wine". Massaya. Retrieved 10 September 2013. Wikimedia Commons has media related to Beqaa valley. This page was last edited on 9 February 2019, at 20:31 (UTC).